We pray for a world of joy. and safety of our children. We pray for courage and strength. The way we live is the way we give thanks. Our life is a dance of prayer and thanksgiving. This Mother's Day, I embrace my own children, thanking my youngest for the potted marigold she rushed home from school, so anxious to deliver it to me in its hand-painted pot that she dropped it on the stairs. I watch my teenage daughter carefully arranging the tulips that her father bought from the fundraiser for the high school. She is trying to calm her agitation, to make a gracious offering, perhaps shy that it was her father who bought the flowers. 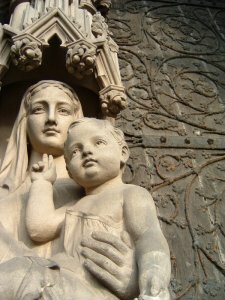 I know my children love me tenderly, and that they feel earnest in their desire to honor me. They have seen adds on the television telling them to buy mom perfume, flowers, and diamond necklaces ~ enough adds to turn my stomach and wrench my heart. They worry that the flower grown from a seed, the spilled dirt on the stairs, the painted plastic pot- somehow these will fall short. that the greatest gift of all is their very presence in my life; every day is Mother's day, and I am always blessed? This Mother's Day I offer my mother my own potted plant, feeling too that it fails to meet the task of honoring her, of thanking her for giving me my life, and letting her know how much I cherish our times together- the phone calls, family dinners, the walks in the woods. To have the presence of such a friend, confidant, and quiet cheerleader is no small luxury, I am well aware. This Mother's Day I extend my mothering instinct out beyond the walls of my own household and into the world. I hold in my heart all people, all children. My heart goes out to all the women who are raising their children in the agony of a war-torn neighborhood. I hold every orphan, all children who have become soldiers, all children who are hungry. I keep in my heart all children who are deprived, for whatever reason, a basic sense of security, love, and possibility. And this Mother's Day I give thanks to the earth for her abundant offerings of nourishment and beauty, patience, forgiveness and hope. 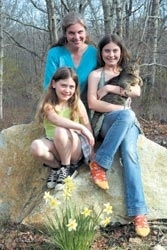 My daughters and I were featured in the local paper this week. CLICK HERE to see the article. 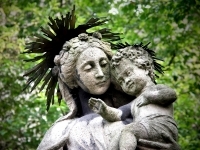 For many informative articles about the history of Mother's day, visit HERE.